Unwanted hair is an embarrassing problem for both men and women. Noninvasive laser hair removal has become the gold standard for permanent hair removal with no down time and little maintenance needed. Shaving, waxing, and electrolysis are not only painful, but must be repeated indefinitely. At our medical spa, Dermlounge, Dr. Neil J. Zemmel and Rachel Duke, NP have the expertise and knowledge to safely help reduce and possibly eliminate unwanted hair from any part of the body or face. At Richmond Aesthetic Surgery we use an Apogee Elite-Alexandrite (755nm) & ND YAG (1064nm) laser that is shown to provide excellent results for all skin types. It is proven effective on all parts of the body including bikini, armpits, legs, arms, face, abdomen, chest, and back. The laser targets the pigment called melanin of the hair follicle and sends a heated beam of light to permanently alter the hair follicle and eliminate growth. Patients with darker hair and fair skin are the best candidates, but it is safe and effective in darker skin tones at lower settings. Unfortunately, the laser is not effective for blonde, grey, or white hair because the laser cannot differentiate between the skin and the hair, due to the lack of pigment. Patients should expect to have approximately 6 treatments, each one 4-8 weeks apart, depending on the body area treated, for optimal results. Hair grows in several different cycles, and in order to have permanent hair removal, you must treat the areas when the hair is in the active growth phase. In any one area, you will have hair in all stages. Therefore multiple treatments are required for the best results. Most patients can expect up to a 30% reduction of hair after the first treatment. Hair is present on almost all the surfaces of the body in both men and women. There are many factors that contribute to the growth of hair, including exercise, diet, genetics, hormones and hair type. It is also known that hair grows the quickest during the winter making it the best time to begin permanent laser hair removal treatments. 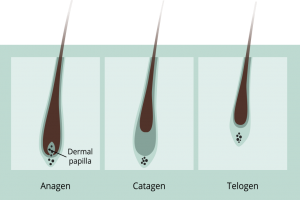 Hair growth occurs in three cycles: anagen phase, catagen phase, and the telogen phase. Once a hair goes through all of the phases it then starts all over again. This phase is the active growth phase of hair and is the longest of all three. Genetics is the main factor that influences this stage of hair growth. The hair continues to lengthen as dead cells of keratin are continually pushed to the surface of the skin. As a long as a hair stays in this phase, it will continue to grow for up to eight years. The average rate of hair growth is 1.25 centimeters per month and 85% of hair on the head is in the antagen phase at one time. It is during this stage only that permanent laser hair removal is effective. After the anagen phase is complete, hair then enters the catagen phase, also known as the transitional phase. During these two weeks, the papilla detaches from the hair follicle and does not allow any more nutrients to reach the hair. The sebaceous glands, which provide oil to the skin, also secrete less sebum, and in return hair growth ceases and the hair follicle shrinks in size. The hair is dormant during this phase but is not shed. The telogen phase is the final stage of hair growth and lasts approximately three months. During this time the hair is still attached to the follicle but does not grow. A new hair begins to grow in the anagen phase and the existing hair strand is pushed out by the new growth. We lose almost 100 hairs in a given area when the telogen phase is complete. Fortunately for humans, only 15% of our hair is in the telogen phase at a given time so the shedding goes unnoticed. Laser hair removal should always be performed by a licensed and knowledgeable health care professional. Dr. Zemmel ensures that his patients receive the highest quality treatments that yield the highest quality results. At Richmond Aesthetic Surgery, laser hair removal is always performed by nurse practitioner Rachel Duke, NP. There is very little preparation required prior to a treatment, making it easy to do during a lunch break or after work. Most appointments take 10 to 60 minutes depending on the size of the area to be treated. Laser hair removal is a virtually painless procedure, and no local anesthetic is required. Patients should expect to feel a warm sensation during the procedure due to the heat produced in order to damage each hair follicle. For additional comfort, a hose is attached to the laser handpiece blowing very cold air to help anesthetize or numb the skin. Patients should arrive to their appointment with a clean, close shave. The laser will target the hair shaft below the skin surface where it will disable further growth. Long hair present on the skin surface will waste the laser energy, “singe” it, thus never targeting the intended structure which is the hair root sheath that lies below the skin surface. The hair root below the skin surface needs to be present in order to be targeted by the laser; therefore, it is best not to wax, pluck, or use depilatory creams for at least 4 weeks prior to the treatment. Dr. Zemmel also recommends that patients not arrive at their appointments with any self-tanners, tanning bed, sunburn, or new tan within 2 weeks leading up to your appointment. Any darkening or pigment changes of the skin, even if not visible to the human eye, will be detected by the laser and therefore reduce the amount of hair eliminated per session. Every patient responds differently to laser hair removal. There is always a small chance that the hair will not be completely eliminated within the six treatments. In most cases, hair production is eliminated by approximately 90%, and any remaining hair is much softer and finer to start with. There are very few complications related to laser hair removal. The most common side effects include redness and mild swelling of the treated areas that resolve within 24 to 48 hours. Aloe Vera gel and cold compresses will be provided immediately following the procedure. There is no downtime for activities with laser hair removal; however, we recommend not overheating the body by avoiding the sun or very hot showers for the first 48 hours to avoid prolonged redness, swelling, or blistering of the skin. A small percentage of our patients will have mild oozing and crusting of the skin within the first 24 to 48 hours after treatment. If any small blisters arise, do not “pop” them; simply allow the body to reabsorb the fluid. If the blister opens, then apply an antibiotic ointment such as over the counter bacitracin. Rachel Duke, NP will also provide you with detailed written instructions after the procedure.